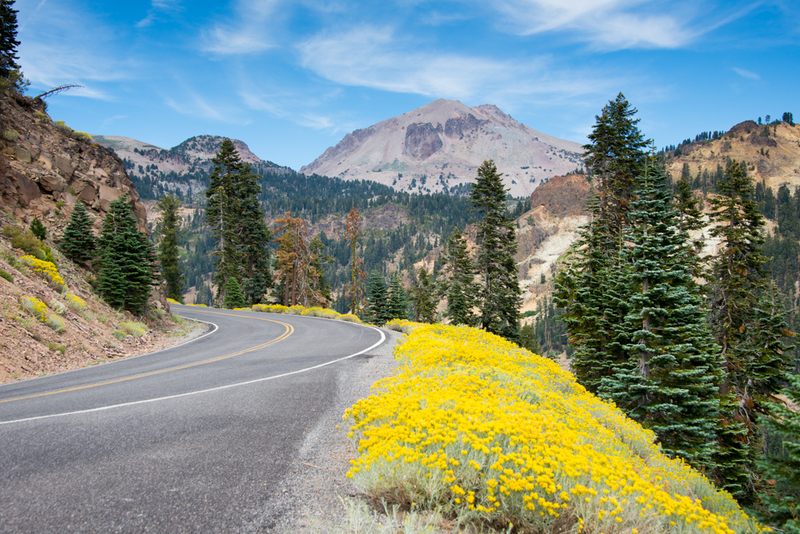 It’s amazing how close Lassen National Park is to such populated areas as the San Francisco Bay Area and Sacramento region, yet it is relatively empty compared to other National Parks in the golden state. I chose one of those holiday weekends where the news threatens that millions of people are going to be on the road, causing traffic anywhere and everywhere. However, Labor Day weekend was relatively peaceful. 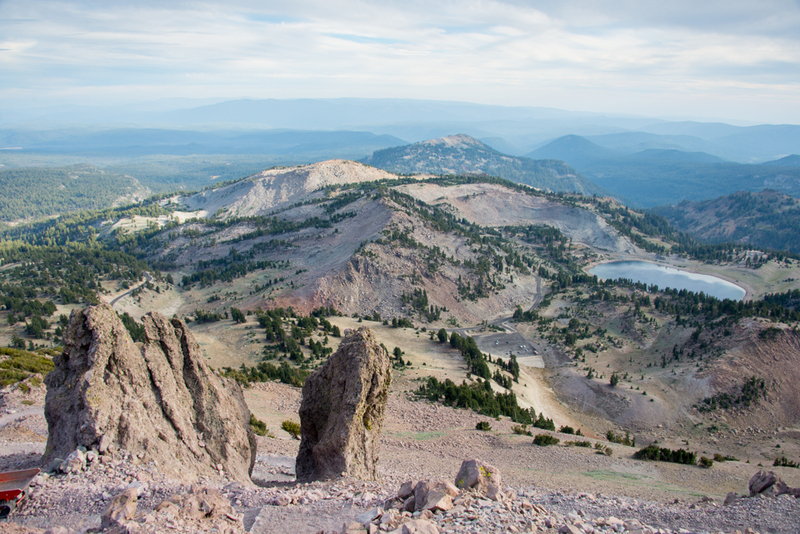 Lassen National Park was our first stop on a four day adventure that spanned Lava Beds National Monument and Crater Lake National Park before returning back home. 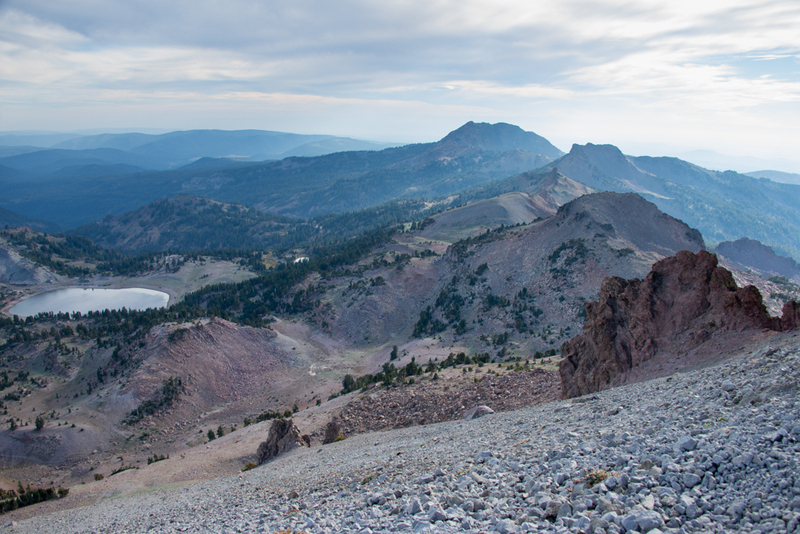 We fit a lot in our trip, but we definitely could have spent the entire weekend exploring Lassen and still only have gotten a snippet of what the park has to offer. Considering our limited time in the park (two half days), we had to pick and choose. 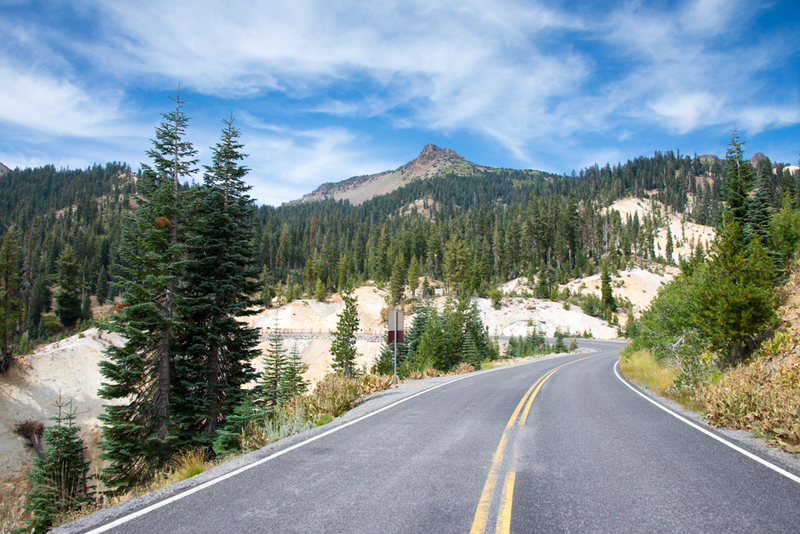 We decided to drive straight to the Mt Lassen Trailhead from the south entrance, along highway 89. Highway 89 is an amazingly scenic road that has pull outs to take in the scenery and the geology of the active volcanic area. 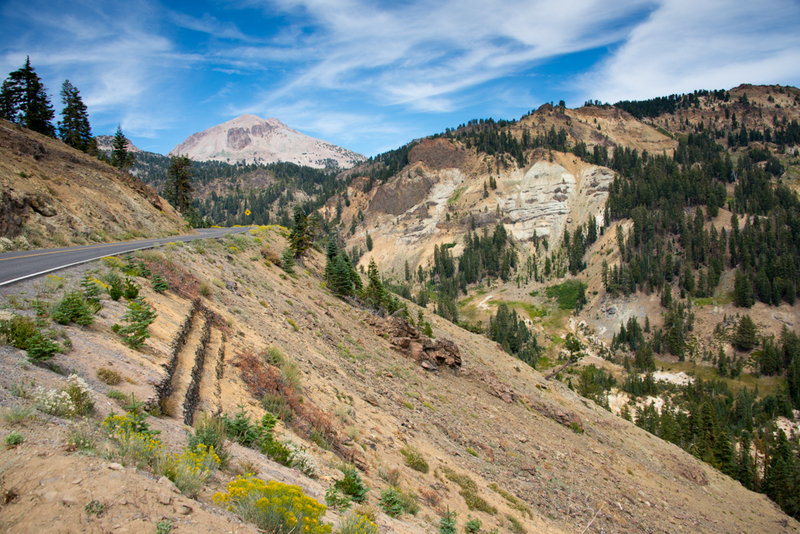 Volcanic tuff and ash deposits litter the park as you drive toward the summit of the volcano. Lake Helen, a crisp blue on sunny days. Try to spot it later from the summit. 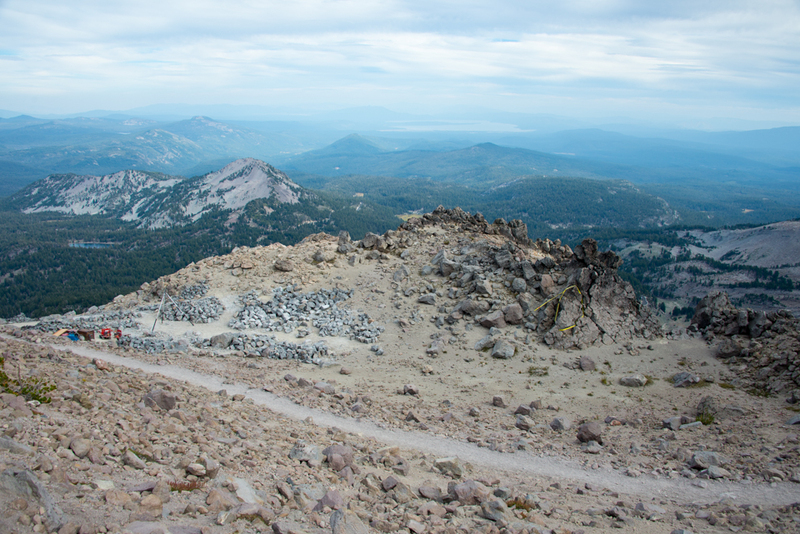 The hike to the summit of Mount Lassen currently has limited openings due to trail restoration and rehabilitation. 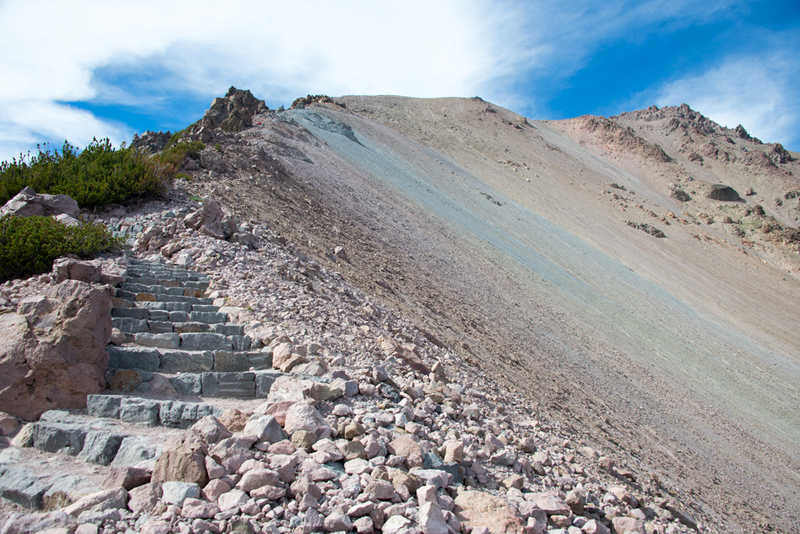 But according to the national park website, 2014 is the last year of trail rehabilitation. 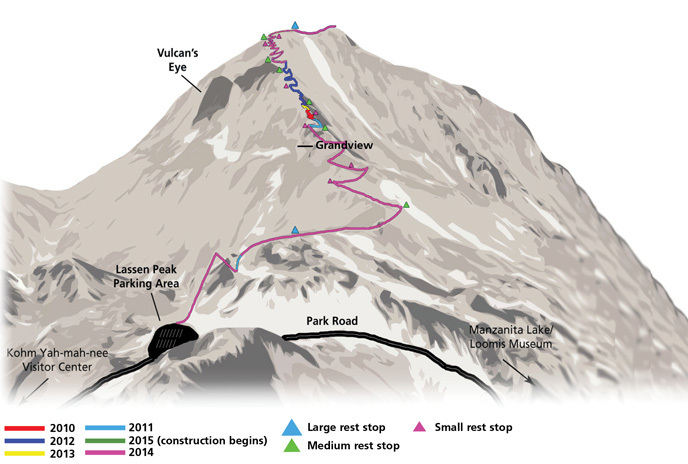 Reach the Peak Project for Lassen Summit Trail. 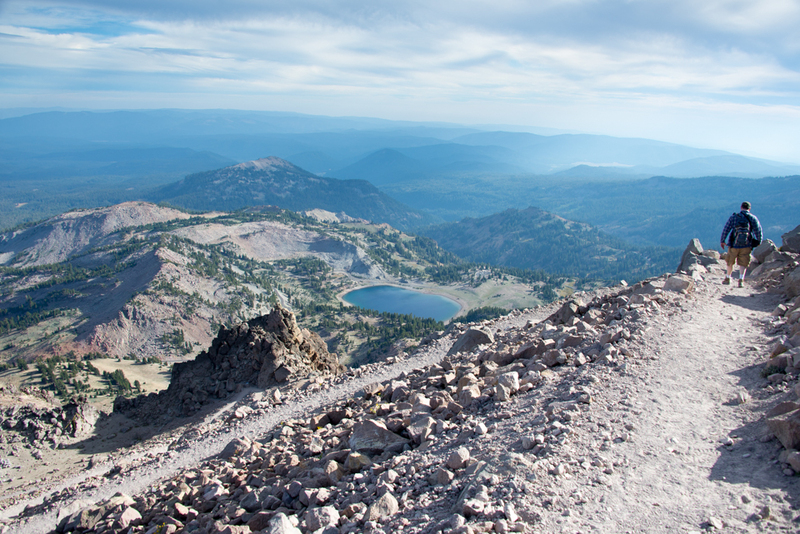 The trail to the summit of Mount Lassen was open for Labor Day Weekend this year. 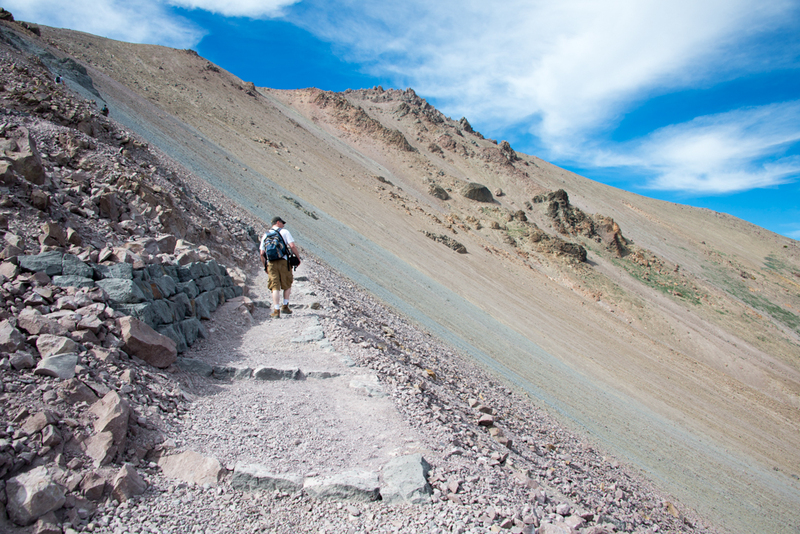 The trail consists of a steep 2,000 feet elevation gain over the course of about 2.5 miles (5 miles round trip). It generally takes 3-5 hours to complete. We were lucky to hike to the summit without any threatening thunderstorm clouds, which are common in the summer months in the Sierras. The hike was incredibly windy and chilly about half way in, and I found my trekking poles extremely useful while lugging my camera gear. And one may think, 2.5 miles isn’t very far, but the elevation definitely affects you especially if you’re just driving in from the lower elevations in the valleys near the mountains. When the trail is closed, these steps are the point where you are forced to turn around. 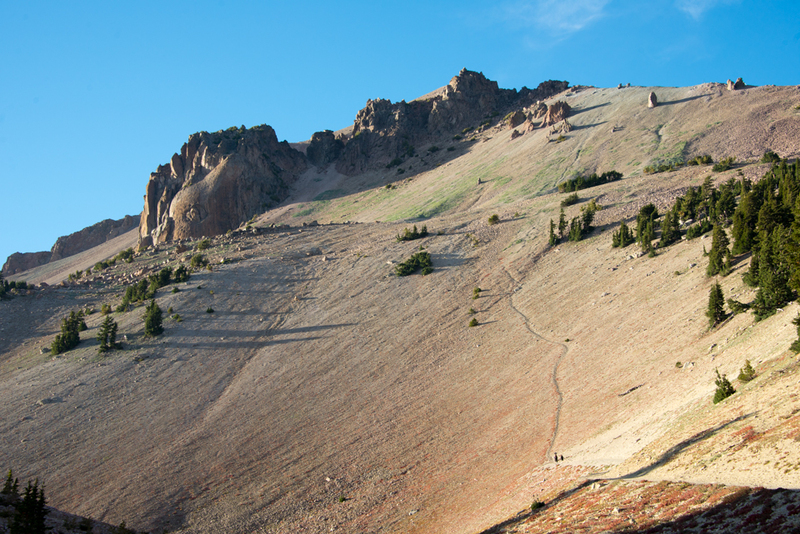 The smooth steep side of Lassen Peak is caused by glacial erosion, and is known as a cirque. 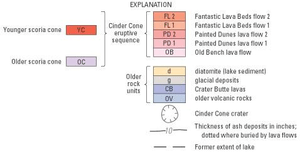 A glacier once extended 7 miles outward from the dome during the last Ice Age, (25,000 to 18,000 years ago). Evidence of the trail work was left in place. 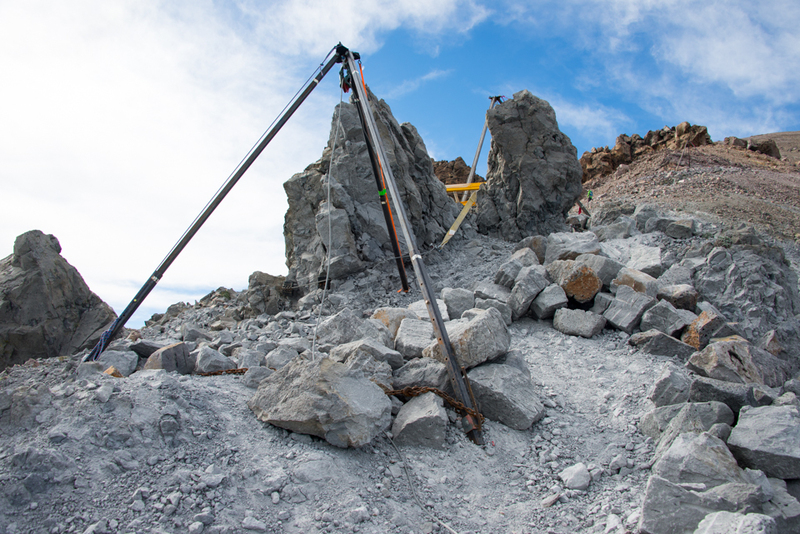 Small tractor devices and tripods were left, strapped to large boulders so they wouldn’t fall or tip in the wind. Cut rocks were stockpiled to be readily accessible for walls to be built. And at 10,457 feet elevation, the summit was reached! 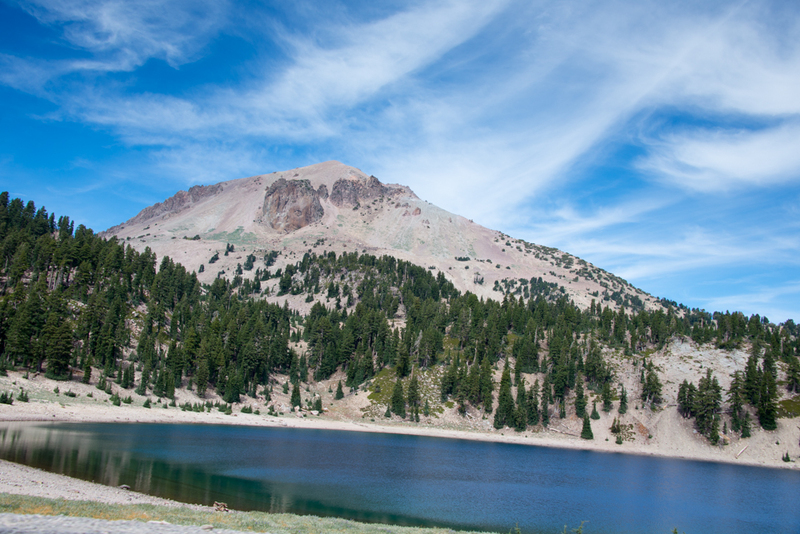 Lassen Peak is the largest of 30 volcanic domes that have erupted over the past 300,000 years in Lassen Volcanic National Park, and is one of the largest volcanic domes in the world. 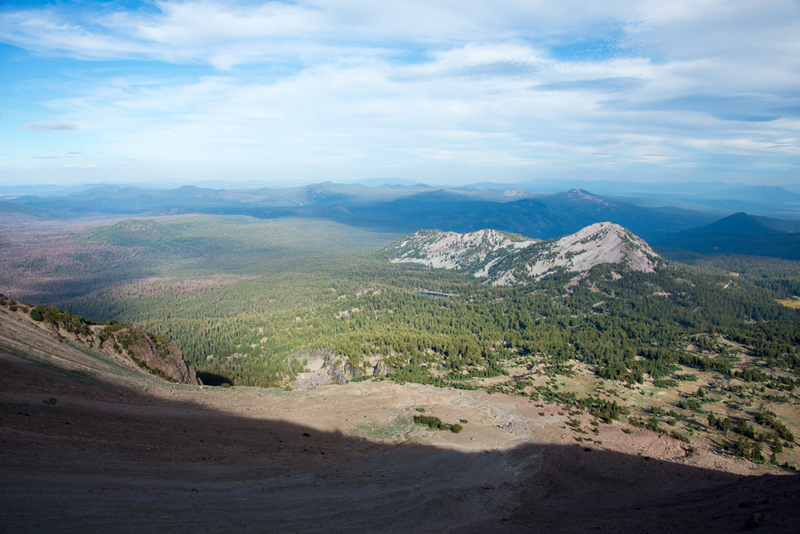 Eruptions from 27,000 years ago formed the Lassen Peak volcanic dome probably in a matter of a few years. 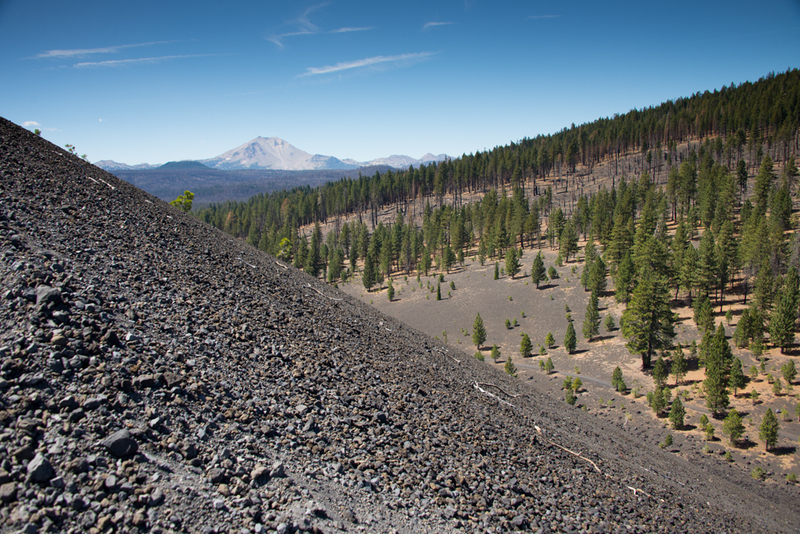 The dacite lava rock is some of the youngest rock in the state of California, having formed during the Lassen Peak eruptions between 1914 and 1917. We returned to our vehicles as the sun was setting. Beautiful is an understatement. We found a lovely campsite at Crags campground within the park. 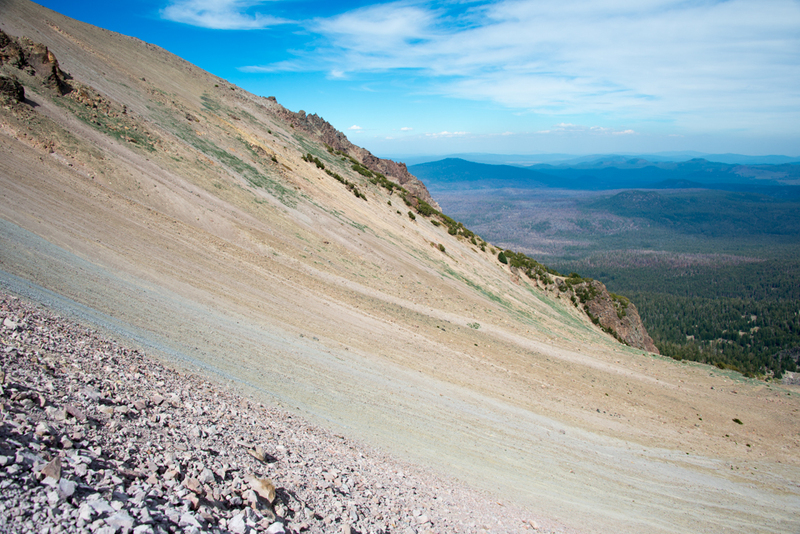 The following morning we headed to the Cinder Cone. 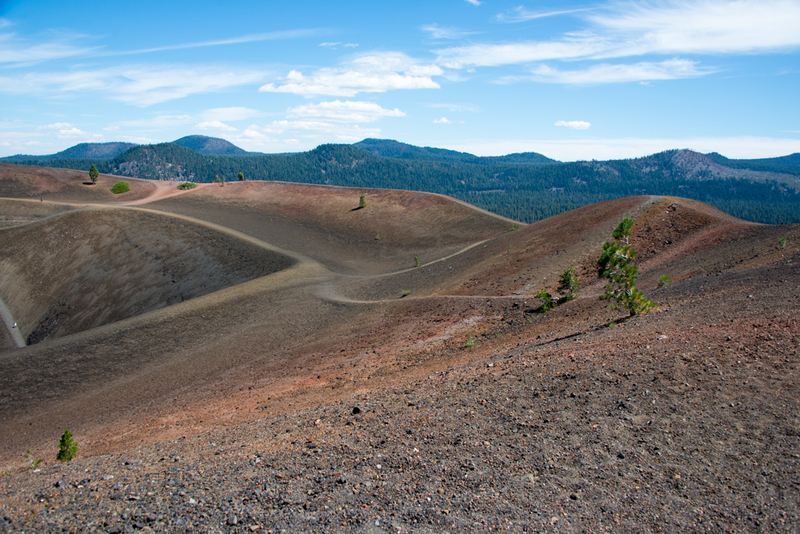 To reach the Cinder Cone by vehicle, you exit the park and re-enter, heading toward Butte Lake. A 6 mile dirt road leads to Butte Lake, which also has a developed campground with flush toilets. The road is relatively maintained with a few washboard areas, but high clearance is not required and a regular car/sedan can totally make the trek. Butte Lake is a lovely area to relax. 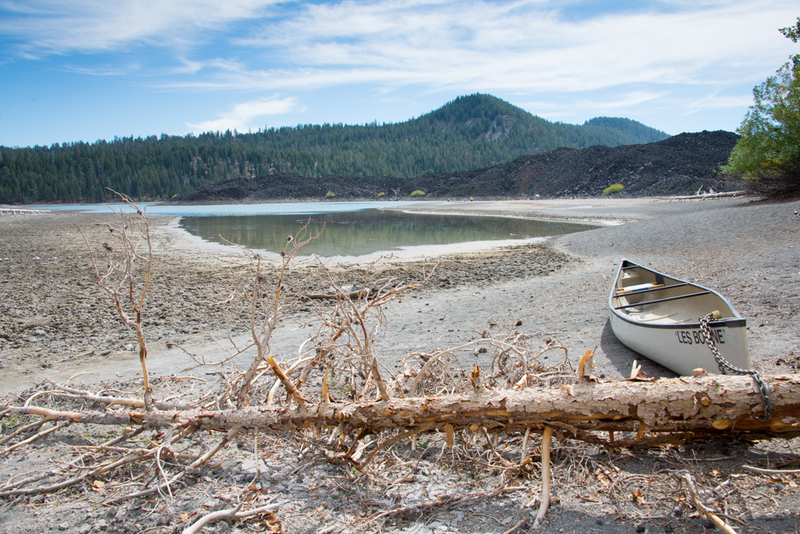 The lake level was incredibly low due to this California drought. Despite the low lake levels, people were still kayaking and splashing around in the water. Butte Lake is fed by nearby Snag Lake seeping through the lava beds. 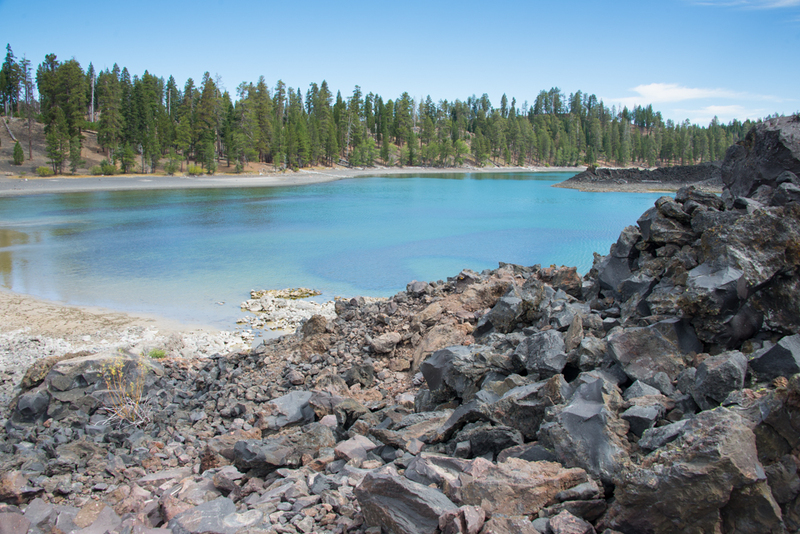 Both Butte and Snag Lake were created when the lava flows dammed up creeks. Incredible low lake level. We were walking on what is normally under water. 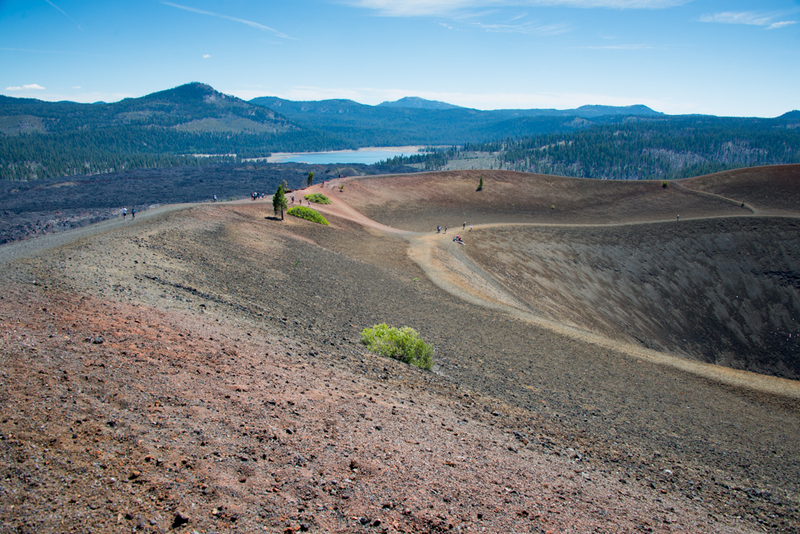 After you park at the trailhead next to Butte Lake Campground, it’s a 2 mile hike to get to the Cinder Cone. The trail has a slight elevation gain, but it feels like more of a work out it’s so sandy, it’s like walking on a slightly inclined beach. It is rated as moderate. At least the shade of the trees helps on those warm days. 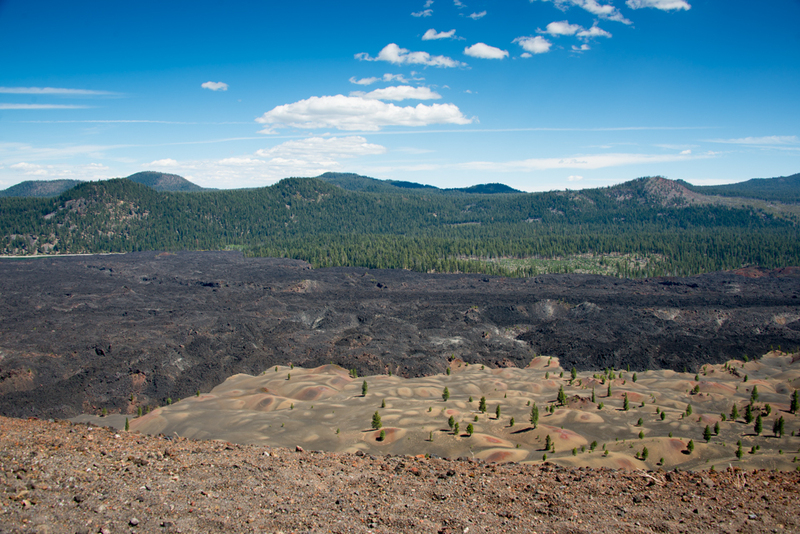 Once you reach the Cinder Cone, the forest dissipates and shade diminishes. 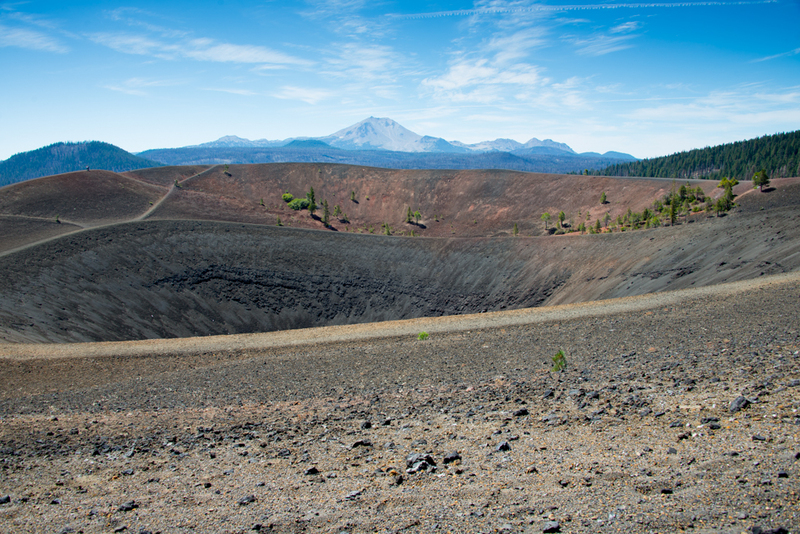 The trail to the Cinder Cone is rather historical as it follows a portion of the Nobles Emigrants Trail. 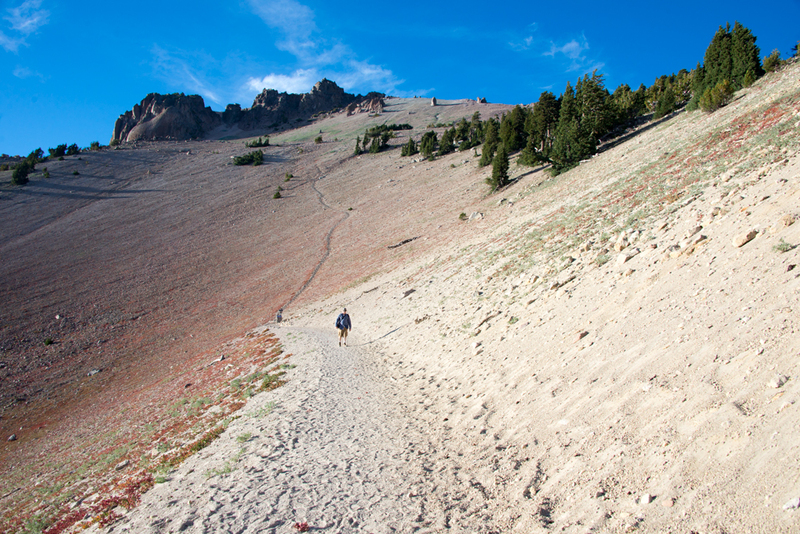 It was pioneered by William Nobles in 1851 and was widely used until the 1870s as an easy shortcut between the Applegate Trail in Nevada and the Lassen Trail in California. It was extensively used until the 1870s, when it was superseded by railroads. 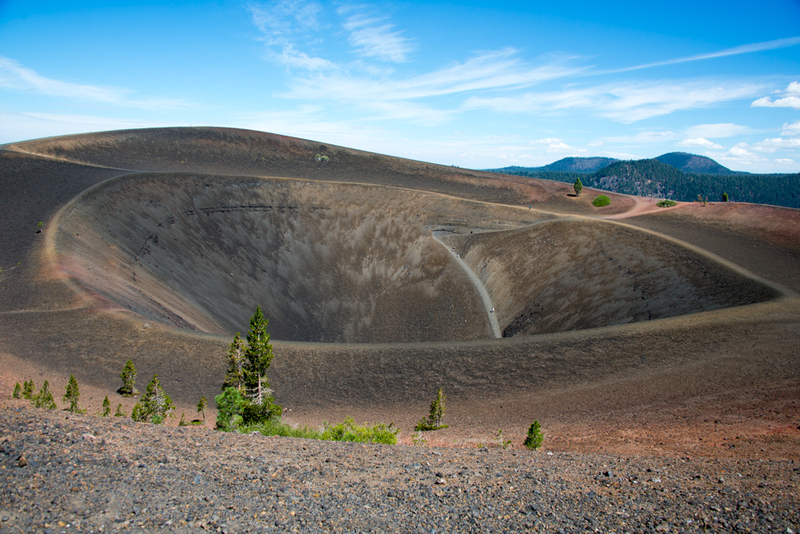 As you turn the corner and feast your eyes on this lovely Cinder Cone, your first thought is… Am I really going to climb that steep trail? 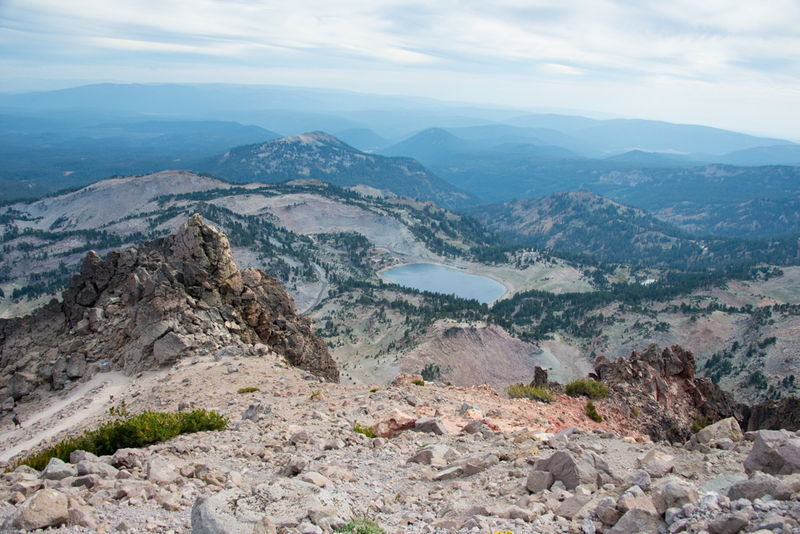 As you slowly climb the rocky trail and near the top, you get wonderful views of Lassen Peak. 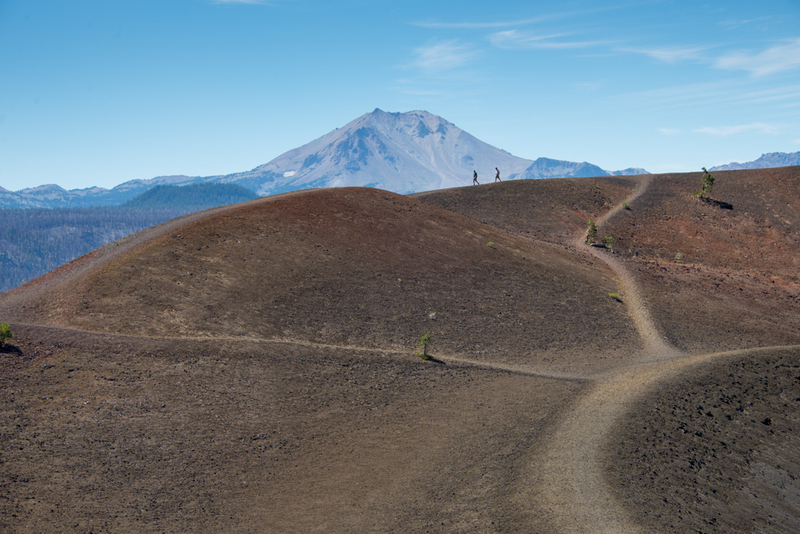 Once you reach the top of the trail, you are greeted with even more pathways to explore the top of the Cinder Cone as you catch your breath from the climb. The contrast of the red and brown rocks with the bright blue sky is a sight to behold. 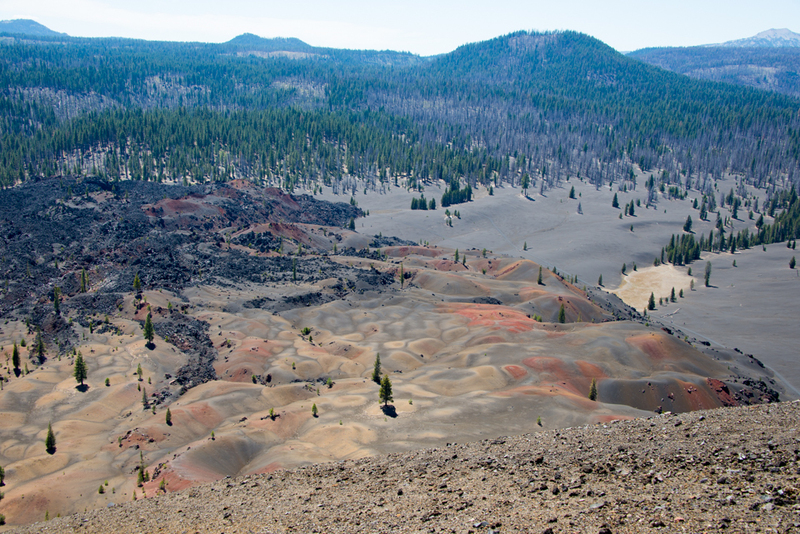 You can see where the lava flowed out of the Cinder Cone. The oxidized iron contrasts with the pale brown and gray rocks, and it gives the Painted Dunes their reddish color. 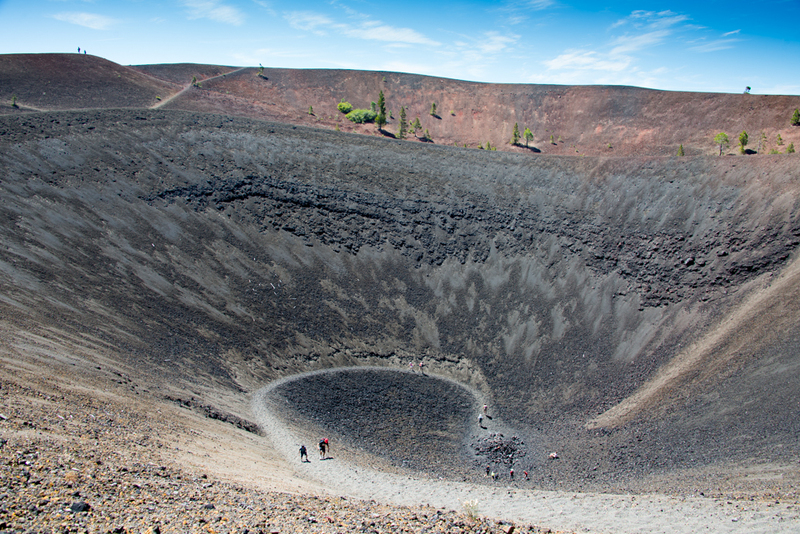 You can climb down into the center of the Cinder Cone crater if you’d like. Snag Lake seen in the distance on the left. 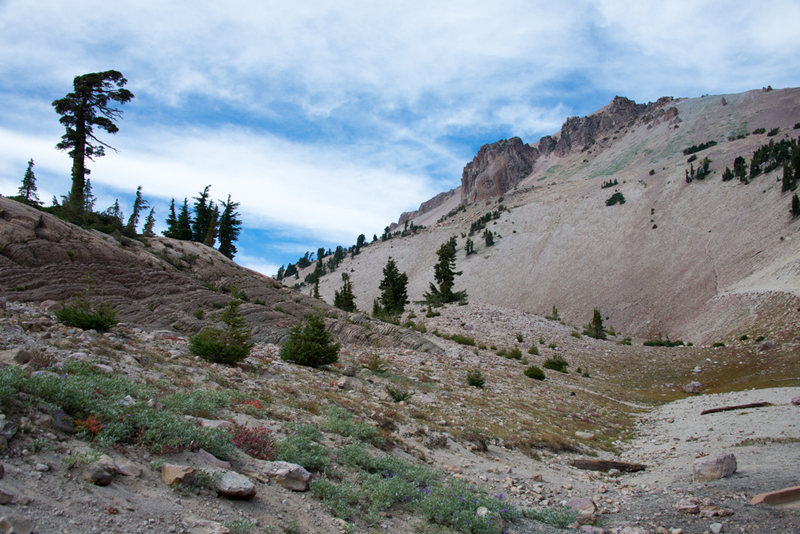 Lassen Peak seen on the right. This panorama was formed by combining 3 different photos. 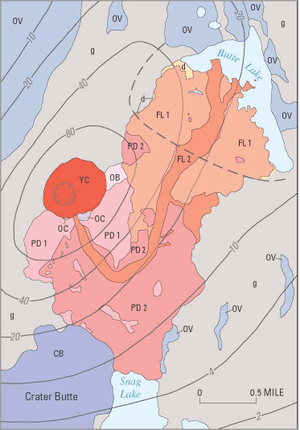 I wish I could have explored that area more, but we decided to move northward. 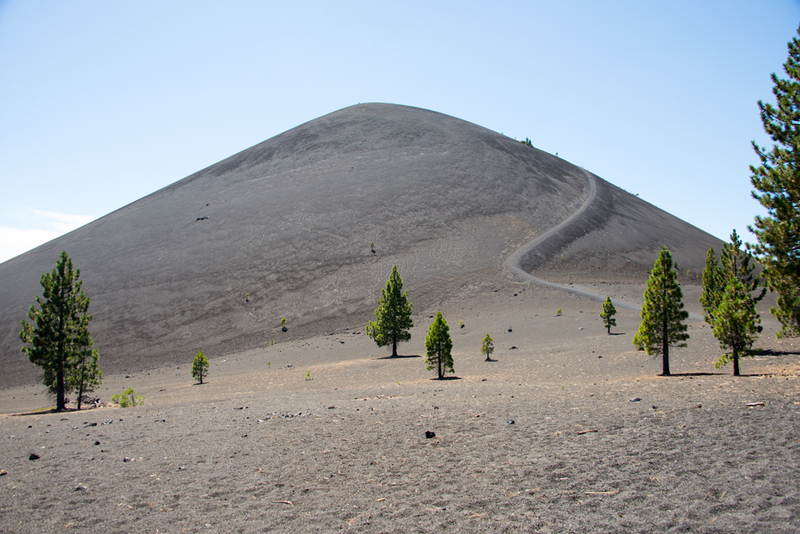 If you don’t think you can handle the steep gravelly climb to the top of the Cinder Cone, there are trails that bypass and hike around the Cone. If you’re feeling particularly adventurous you can climb around the basalt flows, but I wouldn’t suggest doing so. The lava flow seems primarily to be a’a lava, which is rather sharp. 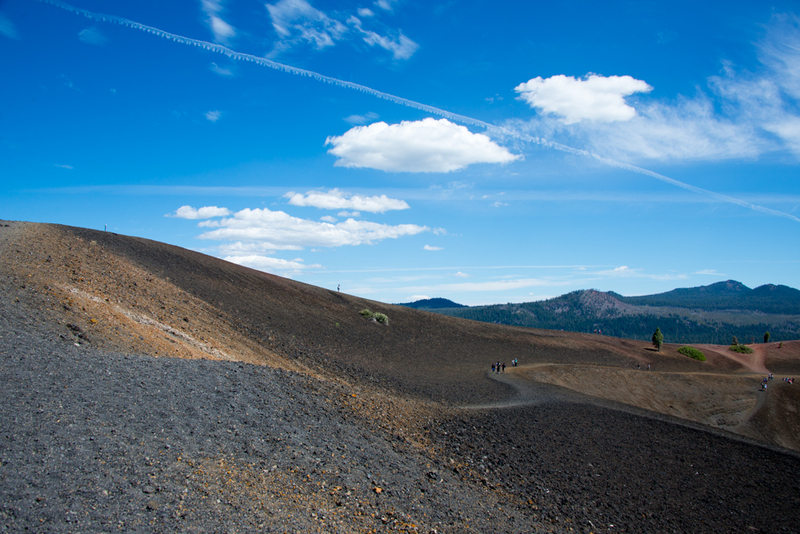 Definitely wear some sturdy shoes, or at least closed toed shoes, if you plan to venture out to the Cinder Cone area.